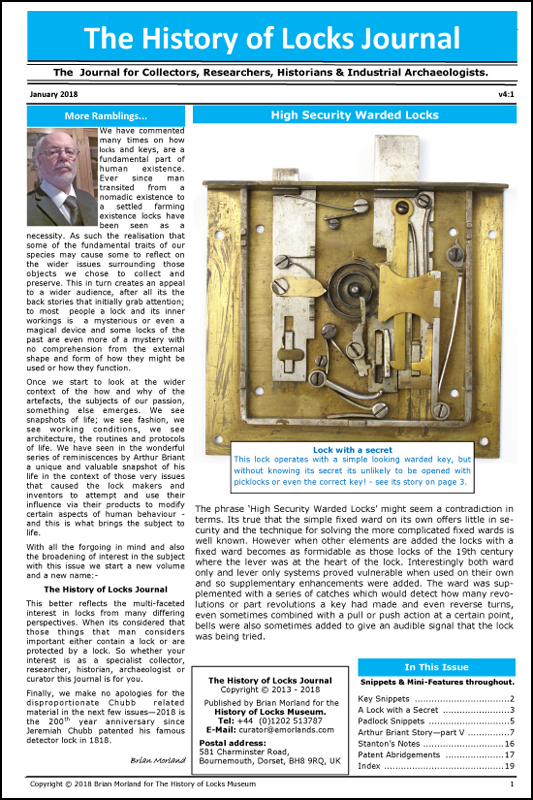 The Chubb Archive, www.chubbarchive.co.uk, website is now resourced and maintained by The History of Locks Museum. We have built on Peter Gunns' original concept and also given it a facelift including the creation of on-line examples from the registers. We can in most cases advise the day/month/year of manufacture from the serial number marked on your lock. More details on the Chubb Archive web site. Nicely done with the site. Thanks Oldlock for the positive feedback re the site -hopefully it will be useful to everyone. Do you want pictures and numbers of other locks to add to the record there ? Yes please - Most people of our generation look back on Chubb with great fondness. The more of the story we can record the better. I would of course be pleased to add to the site, I can also look up the records for the exact date of manufacture (there are a few anomalies and some missing data). I'm also keen to track down past employees. I know a lady who worked putting together the 110 and other detainer based Chubbs in Willenhall. She works for my dad. I know this because I was rekeying a 3K70 on one of his benches and she commented! Thanks Nigel, do pass on her details or ask her to get in touch if she would like to reminisce or be recorded on the Chubb people page.